Yuliya is #1 Entertainer in NJ,NY who offers an unparalleled quality shows *(link hidden)* whose fun and elegant entertainment earned her 175 REVIEWS on gigmasters .Awards BEST of 2017,2016,2015, 2014, 2013 ,2012, 2011 in NY,NJ .She has appeared on MTV 2015 , August Issue of Contemporary Bride magazine ABC and TV Asia and also collaborated L'OREAL ,her graceful dancing has landed her on stages of countless prestigious venues:PLAZA HOTEL, BORGATA CASINO, BROWNSTONE HOUSE, BERGDORF GOODMAN , SEPHORA ,ATLANTIC CITY. Yuliya is a great entertainer and a first class show. No need to look further she is great! She performed for my dads 80th bday party for a family & friends party and everyone young & old loved her. My father and our guests thoroughly enjoyed Yuliya's show. The props used and audience participation was a big hit. Yuliya was great and amazing!! She was flawless and everyone loved her!! Great performance and interaction with the guests. I'd would highly recommend her for any occasion you are having..
Everyone enjoyed the show & she's a professional! Would definitely recommend for some entertainment. Yuliya is an amazing and a very talented dancer. I called her for my husbands 40th surprise party and she definitely made it a memorable one for him as well as the crowd. She was pretty flexible with my requirements and is a very warm and cooperative person. I will give her 5 stars. Thank you very much ..we had a blast! Thank you for having me ! I loved meeting you and your lovely family and friends . Thank you for this amazing feedback ! Thank you so much ! Your party was one of the best I ever danced at . I hope to see your family soon ! I made inquiries on a Friday and booked Yuliya for Sunday on short notice. Couldn't be happier. All the guests had fun including the birthday celebrant. The kids and teens enjoyed dancing with her. The adults were mesmerized with the dancing and having a great fun time. Thank you for having me ! I had a blast ! Yula is a great dancer, very talented. Her audience involment was very entertaining!! I really will give her 6 stars!! Thank you for having me ! I loved dancing for your beautiful family ! Hope to see you again soon . Yuliya is a very beautiful and talented dancer. Her performance was very graceful and tasteful. Towards the end of her performance, Yuliya brought everyone to the dance floor and made sure everyone was involved. I had the honor to dance with her .She is simply amazing and her dance moves were so well coordinated. Yuliya is a complete professional and she honored all her commitments. Apart from all this, Yuliya is a very sweet person - My hair was a lil frizzy and she let me borrow her hairspray Thank you so much!!!! :) that was so thoughtful she is Outstanding and so charismatic So professional and i could just keep writing about her ! !def will recommend her and i will hired her again !! I can not thank you enough for having me perform at your lovely event. I am looking forward to meeting you again sometime soon . I hired Yuliya to perform at my husband's 40th birthday party and I must say she rocked the party!! Yuliya is a very beautiful and talented dancer. Her performance was very graceful and tasteful. Towards the end of her performance, Yuliya brought everyone to the dance floor and made sure everyone was involved. Since we are Indians, Yuliya included some bollywood numbers in her performance, which we thought was simply amazing as her dance moves were so well coordinated with the bollywood music. Yuliya is a complete professional and she honored all her commitments. Yuliya was authentic,incredibly skilled performer! She made my night simpy unforgettable ! Absolutely incredible dancer,graceful,professional...more then I expected ,Recommend Highly! Yuliya was so lovely. She arrived on time, performed beautifully and seemed to genuinely enjoy making people happy. It was the hit of the party and I feel so lucky to have gotten her on such short notice. Thank you again Yuliya for making my husband's birthday extra special. Yuliya was an extreme professional, from my first contact with her right through the completion of her performance. She lived up to every expectation and wowed the party with her talent. She is a beautiful and talented performer whose love of her art is demonstrated in her dance. 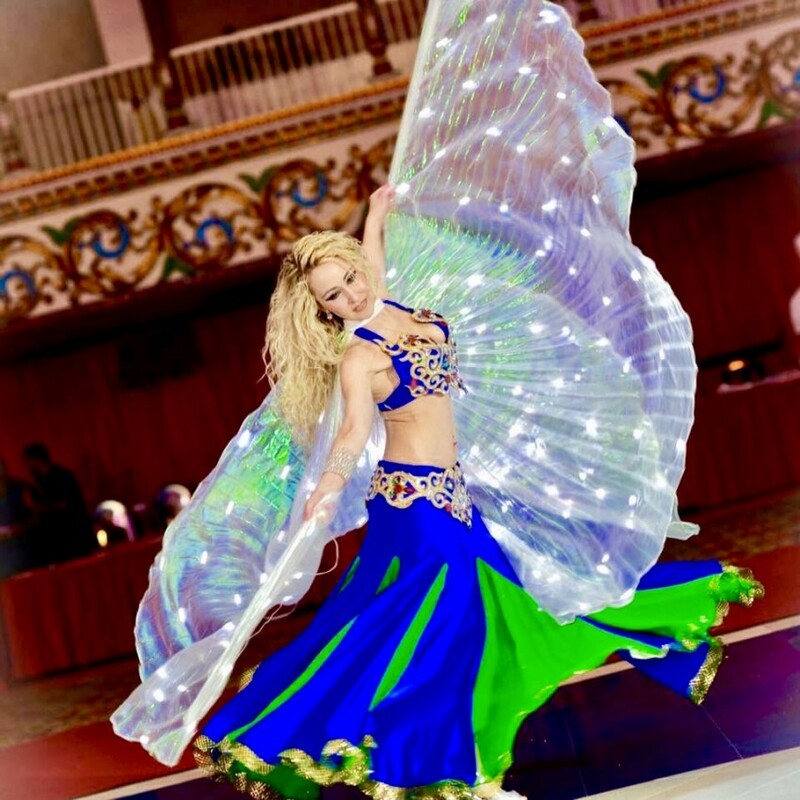 We were totally satisfied and would definitely recommend her to anyone looking for one of the most talented belly dancers out there. She was great, fantastic, pleasant, and beautifull, her performace was very profesional. she meets all my guest expectations, they were very excited. I will give my best recomendations about her. I was really happy because my guest enjoyed the show. All my fiends were calling me the next day to tell me my party was woderfull because of Yuliya performance. Very professional, came in earlier just to have everything (link hidden)l the guest had so much fun.highly (link hidden)ank you Yuliya. This highly acclamed dancer has a natural musicality and understanding of Arabic movement and culture combined with a playful sensuality keep her in high demand. Yuliya's ability to interact and captivate audiences differentiates her from other dancers, and makes for an unforgettable performance full of everlasting memories!!! She began her training with classical ballet in Tadjikistan(former USSR) from a young child,folk, modern and jazz dance and then graduated to Bellydance as her major LOVE! Yulia was stunning. her performance , her charm blew away my guests. adults as well as kids enjoyed her (link hidden)e was punctual and she performed longer than the time we agreed. Since it was a special even for being Diwali, she even swayed to Bollywood music. I would give here a perfect 10 in all aspects and you can never go wrong having some one like Yulia for any event. FANTASTIC FANTASTIC FANTASTIC ! their's no words to describe her (link hidden)e was (link hidden) still speechless along with everyone that was there.i would highly recomend (link hidden) daughter the birthday girl was very (link hidden)ank you so much yuliya. Yuliya danced at my son's wedding and was one of the best belly dancers I have ever seen. She is so nice and pleasant to work with from the start. She is so talented, beautiful, professional and with a very sweet personality. My guest loved her and I am so glad I picked her... Best choice ever!!! I highly recommend yuliya for any type party...she is a 10 star. Thank you so much for the wonderful time. You are magnificent !!! Haifa M, Lansdale, Pa, 10/09/2010. Yuliya was amazing! I cannot say enough about her. She is exceptionally professional; she called me to discuss the details of the event and her show well in advance of the day, she arrived early, helped with the staging of the show. The performance itself was fantastic-Yuliya is very beautiful and her dancing is truly intoxicating. She has a very charming personality and was able to get all of ours guests to dance! Everyone is still talking about it and thanks to Yuliya-my husband's 40th birthday party has become legendary.